Aside from professional reading I rarely have a moment to devote to leisure reading. This summer I decided to fix that situation. I teamed up with Random House Canada and became one of their reviewers for Young Adult, Cookbooks & Adult literary works. I am usually enticed by the title of a book, it speaks to me or I can make an instant connection by reading it. My next step is reading the the brief book liner description, in 30 seconds or less I know whether this is the book for me. As with most people, my time is at a premium and I need to know if this book is worth my time. I have to admit this process of giving myself the time to fully commit to a book is a step in regaining some of the “me” time I deserve that has been lost. My first review was worth my time, energy and made me reflect on my own actions. 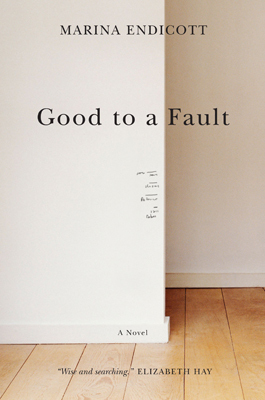 Good to a Fault, by Marian Endicott grabbed my attention at the title. Many times I have been called a good person or someone who does too much, with questions of whether or not am being taken advantage of, making this title made a must read. The story reflects on a 40 something, single, family-less, career embedded woman who upon a chance encounter alters her own life’s course. A car accident (ironically she is an insurance agent) changed the fate of a family on route to “another” new start and our main character Clara Purdy on her way to her to continue her life in the utter doldrums of routine and paper like existence. The matriarch of the family falls ill and Clara introduces the transient family in her peaceful yet purposeless life. Endicott, transitions between chapters effortlessly, with concise symbolically appropriate titles that make the reader ask questions and read with purpose. This book takes the reader on Clara’s journey from singular to plural and the pitfalls & humour that lie within her journey. The author writes from various points of view, the children, the cancer stricken mother, the vicar and the central character Clara. This gave me, the reader, a well rounded perspective of the world in which these characters live and a depth which made me unable to put this book down. All to quickly this book came to an end and left me with more questions. An excellent read during my summer vacation and a fabulous first read with Random House Canada. Marina Endicott won the Commonwealth Writers’ Prize for Best Book, Canada and the Caribbean, and was a finalist for the prestigious Scotiabank Giller Prize for her novel, Good to a Fault. Her first novel, Open Arms, was shortlisted for the Amazon/Books in Canada First Novel Award. Endicott has been an actor, director, playwright and editor, and now lives in Edmonton, Alberta, where she teaches at the University of Edmonton and writes. What did you think of the book? Have you read any other books by Marina Ednicott? Do you have any suggestions for me?